These last few weeks I have been into making kanzashi flowers. At first it looked intimidating but after looking at a few tutorials and cutting out fabric I was on a roll. I found some really awesome vintage buttons that added extra sparkle! 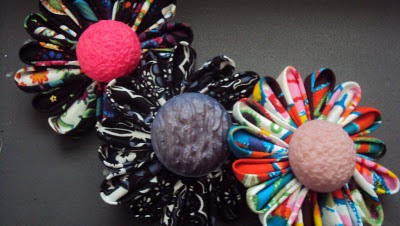 This project is great for using up scraps of fabric and the center can be made from buttons to bottle caps, making it really green! Turn them into hair clips, brooches, or whatever, they are versatile! 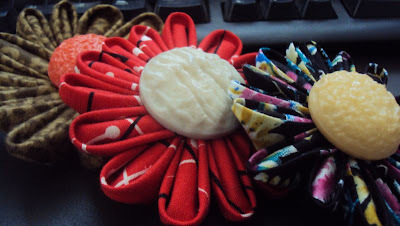 I have more petals that need to be folded! You did a good job. When I was living with my parents there were so many scraps of cloth knocking around now I have nothing here to start with. They are not hard to make - a bit tedious with all the folding!